By all accounts it has been a phenomenal run for stocks. Through the end of 2017, the S&P 500 has had a positive total return in 19 of the last 20 quarters. The S&P 500 recorded a loss of 0.8% in the first quarter of 2018. This is the ninth time since 1990 that the stock market was negative during the first three months of the year. 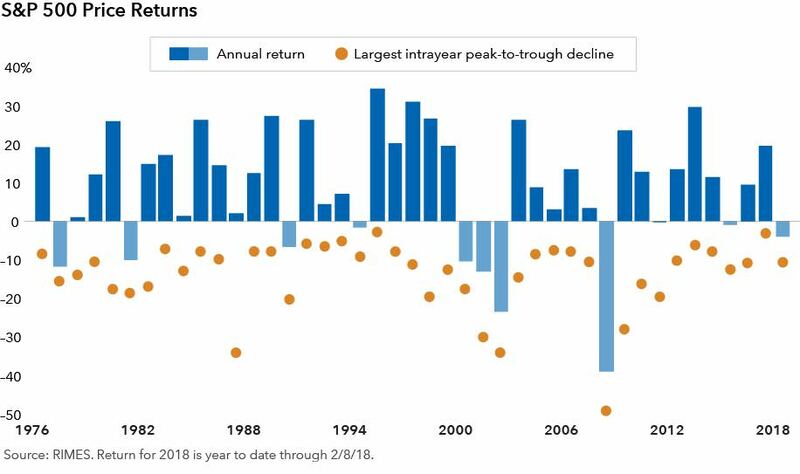 The S&P 500 went on to record a positive return for the entire year in five of the previous eight years that started with a loss (1992, 1994, 2003, 2005 and 2009) and suffered full-year of losses in the other three years (1990, 2001 and 2008). It’s also clear that market volatility is back in 2018 versus the remarkably low volatility we experienced in 2017. To put things into perspective, the S&P 500 in 2017 had a total of nine ​1% gain or loss trading days. In the first quarter of 2018 alone, the S&P 500 has had more than 20 1% gain or loss trading days. Given the uptick in volatility and panic inducing, sensationalized media coverage, I would like to provide you with three​ tips​ to help you stay focused on your long term goals and avoid undue stress that can accompany short term declines in the market. In case you didn’t know, the news media outlets may ​not​ have your financial interest in mind. Their goal sometimes is to keep you in fear and tuned in for better ratings. Market pull backs are ​normal​ and should be expected in exchange for the opportunity of achieving long term growth. Riskalyze Services are for informational purposes only and do not constitute investment advice or an investment recommendation. This chart clearly illustrates how patience pays. 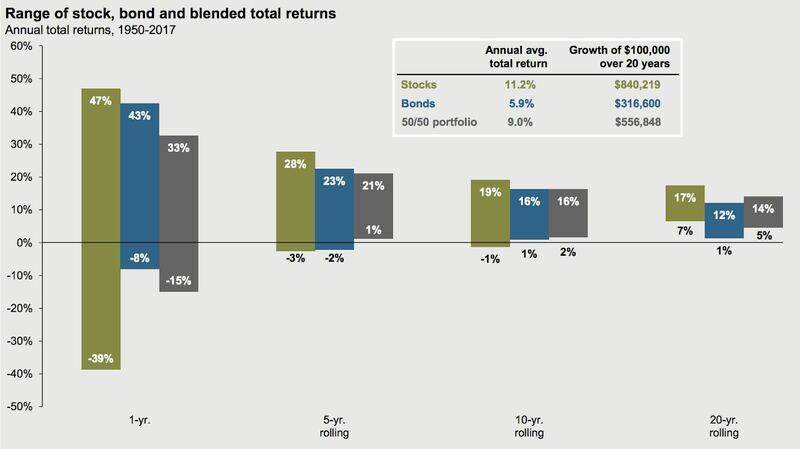 One year losses are common, however; a blend of stocks and bonds have not suffered a negative return in any five-year rolling period. This information does not imply that all future five-year rolling periods will mirror the past. However, understanding historical market data is a powerful tool to “fight the fear” that market volatility can bring about. Past performance does not guarantee future results. Source: Barclays, Bloomberg, FactSet, Federal Reserve, Robert Shiller, Strategas/Ibbotson, J.P. Morgan Asset Management. Returns shown are based on calendar year returns from 1950 to 2017. 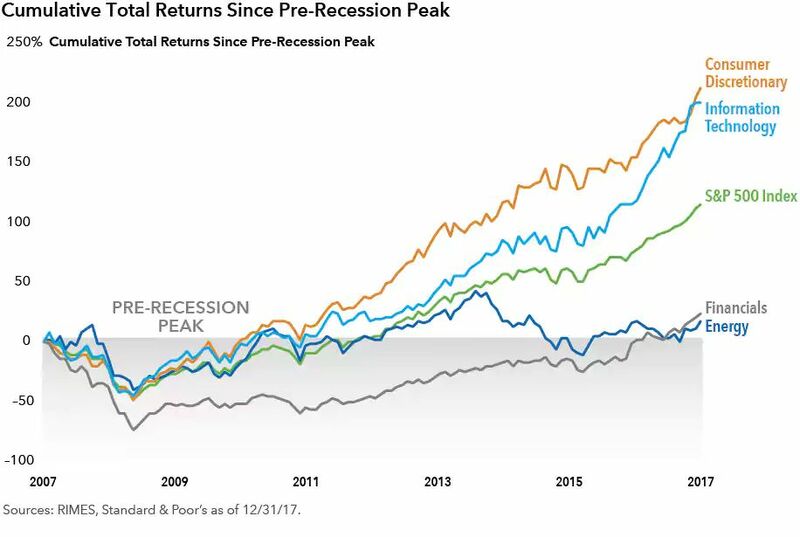 Stocks represent the S&P 500 Shiller Composite and Bonds represent Strategas/Ibbotson for periods from 1950 to 2010 and Bloomberg Barclays Aggregate thereafter. Growth of $100,000 is based on annual average total returns from 1950 to 2017. Guide to the Markets – U.S. Data are as of March 31, 2018. Past performance doesn’t guarantee future results. Examples are for illustrative purposes only. Riskalyze Services are for informational purposes only and do not constitute investment advice or an investment recommendation. 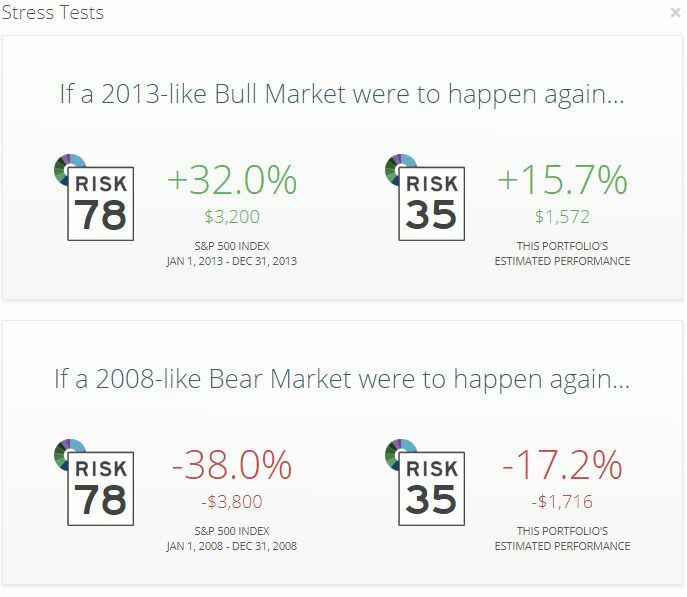 Riskalyze Services are for informational purposes only and do not constitute investment advice or an investment recommendation.